When Lavinia Starkhurst's husband is killed in a freak accident, she takes to the open road and meets a number of strangers, all with struggles of their own. Through these unexpected and occasionally hilarious encounters, Lavinia reflects on her past deeds, both good and bad, explores her two marriages, her roles as caregiver and wife, hoping all the while for self-acceptance and something to give her new life meaning. "The Amendment is nuanced, witty, and insightful, exploring the fetters of family and community that prove impossible to escape. Parrish is a smart, savvy writer with a gift for exploring landscapes of both geography and emotion. Once again, she has produced a work of considerable charm and poignancy." --Jacob M. Appel, author of Millard Salter's Last Day. 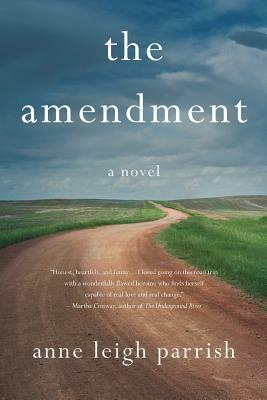 "The Amendment is a beautifully written story about a new widow's struggle to wrap her mind around her husband's death by setting off on a cross-country journey in search of she knows not what. Parrish's prose is eloquent yet crisp, moving the story along quickly. A delightful must-read, sure to take its place among today's top literary fiction "--Michelle Cox, author of The Henrietta and Inspector Howard Series. Anne Leigh Parrish is the author of Women Within; By the Wayside; What Is Found, What Is Lost; Our Love Could Light The World; and All The Roads That Lead From Home.